Na-air batteries are regarded as a potential alternate to Li-air batteries due to the abundant sodium source and high theoretical energy density. However, non-aqueous Na-air battery suffers from the electrode polarization owing to the formation of insoluble discharge product, which severely limits its cyclability and performance. Herein, a high performance hybrid Na-air cell is demonstrated using a dual electrolyte (mixed aqueous and non-aqueous electrolyte) system and three dimensionally (3D) grown tin sulfide (SnS2) nanopetals based air electrode. 3D SnS2 nanopetals are synthesized by a facile solvothermal method and used as an air electrode material for hybrid Na-air battery. The vertically-grown and self-assembled ultra-thin nanosheets of 3D SnS2 nanopetals provide exposed active sites for the efficient air and electrolyte diffusion to air electrodes, resulting in high performance hybrid Na-air cell. The fabricated hybrid Na-air cell displays low overpotential gap (0.52 V), high round trip efficiency (83%), high power density (300 mW g−1) and good rechargeability up to 40 cycles. The proposed 3D SnS2 nanopetals as air electrodes can provide a robust platform for the future development of Na-air batteries and other energy storage devices. The design of cost-effective and highly active catalysts is a critical challenge. Inspired by the strong points of stability and conductivity of carbon nanotubes (CNTs), high catalytic activity of Co nanoparticles, and rapid ion diffusion and large accessible area of three-dimensional (3D) graphene, we demonstrate a novel strategy to construct a hierarchical hybrid structure consisting of Co/CoOx nanoparticles-incorporated CNT branches onto the 3D reduced graphene oxide (rGO) architecture. The surface-modified 3D rGO by steam activation process has a large surface area and abundant defect sites, which serve as active sites to uniformly grow Co/CoOx nanoparticles. Furthermore, the CNTs preserve their performance stably by encapsulating Co nanoparticles, while the uniformly decorated Co/CoOx nanoparticles on the 3D rGP exhibits superior electrocatalytic activity toward oxygen evolution/reduction reaction due to highly exposed active sites. Employing the hybrid particle electrocatalyst, the seawater battery operates stably at 0.01 mA cm-2 during 50 cycles, owing to the good electrocatalytic ability. Redox flow battery (RFB) technologies have become play a significant role in the future for the storage of electrical energy produced from intermitted renewable energies such as solar, wind, and hydroelectric powers. Although the development of high-energy density RFB remains a challenging. Herein, we report the Na-aqueous-catholyte RFB (NaAqRFB) towards high-density electrical energy storage. Na-metal anode offers a high energy density and the use of an aqueous flowing catholyte decouples the energy and power. NASICON (Na3Zr2Si2PO12) is employed as a solid electrolyte in the NaAqRFB to separate the Na anode and a flowable aqueous catholyte. The constructed prototype NaAqRFB operates using a sodium-hexacyanoferrate solution as the aqueous catholyte with no added supporting salt/electrolyte, and yielded an average cell potential of ∼3.06 V (vs. Na/Na+), and an energy density of 54.16 Wh L−1 (based on the volume of catholyte) with high energy efficiency (∼92%, over 50 cycles), outperforming conventional RFB. The present work offers a new route for developing high-energy-density redox flow batteries. Layered Na0.5Co0.5Mn0.5O2 material is synthesized through a facile mixed hydroxy-carbonate route using (Co0.5Mn0.5)2(OH)2CO3 precursor and well characterized as a hexagonal layered structure under P63/mmc space group. The lattice parameters and unit cell volume (a = 2.8363 Å, c = 11.3152 Å and V = 78.83 Å3) are calculated by Rietveld refinement analysis. A flaky-bundle morphology is obtained to the layered Na0.5Co0.5Mn0.5O2 material with the hexagonal flake size ~ 30 nm. Advanced transmission electron microscopic images are revealed the local structure of the layered Na0.5Co0.5Mn0.5O2 material with contrasting bright dots and faint dark dots corresponding to the Co/Mn and Na atoms. Two oxidation and reduction peaks are occurred in a cyclic voltammetric analysis corresponding to Co3+/Co4+ and Mn3+/Mn4+ redox processes. These reversible processes are attributed to the intercalation/de-intercalation of Na+ ions into the host structure of layered Na0.5Co0.5Mn0.5O2 material. Accordingly, the sodium cell is delivered the initial charge-discharge capacity 53/144 mAh g–1 at 0.5 C, which cycling studies are extended to rate capability test at 1 C, 3 C and 5C. Eventually, the Na-ion full-cell is yielded cathode charge-discharge capacity 55/52 mAh g–1 at 0.212 mA and exhibited as a high voltage cathode for Na-ion batteries. Low-cost oxygen evolution/reduction reaction (OER/ORR) catalysts are critically important for energy conversion/storage systems. Here, a porous carbon (PC) catalyst is prepared as a low-cost catalyst from grapefruit peels biowaste using a facile hydrothermal carbonization combine with a chemical activation process. When examined as OER/ORR catalysts in seawater, the PC exhibits an unexpected, highly efficient catalytic activity. From density functional theory (DFT) calculations, we found that sp3-bonded carbon atoms, zigzag edges with or without –COOH and –OH, and armchair edges with C-O-C are responsible for the superior activity of OER/ORR. The suitability of the PC as a catalyst is tested in the half-cell of a Na/Seawater battery, which exhibits a decreased voltage gap of ∼0.47 V between charge and discharge voltage curves. This value is even lower than that of Pt/C (∼0.68 V), IrO2 (∼0.66 V) and MnO2 (∼0.73). 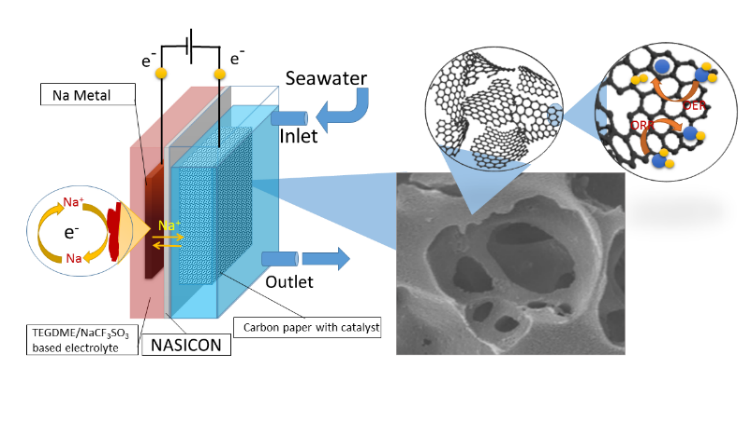 Also, a full cell of the metal-free seawater battery is assembled using hard carbon and PC as anode and catalyst, respectively. The full cell shows a lower voltage gap (∼0.65 V) with the voltage efficiency of ∼83-84% and excellent cycle life over 100 cycles. Our result confirms PC derived from grapefruit peels as an alternative to expensive Pt/C and IrO2 catalysts for the OER/ORR activities in seawater battery. Cobalt pyrophosphate (Co2P2O7) has emerged as an attractive material due to its high specific energy and redox behavior of cobalt, however, problems associated with its poor specific capacitance and cyclic stability have prevented its realization. Here, the authors circumvent these problems by hydrothermally synthesizing layered Co2P2O7 nanosheets (lateral size ≈300 nm with average thickness ≈15 nm) and demonstrate significant improvements in the specific capacitance of Co2P2O7 nanosheets by the addition of a redox additive (K3Fe(CN)6) into KOH aqueous electrolyte. Without the additive, Co2P2O7 nanosheets show specific capacitance of 286 F g−1 at 1 A g−1 current density. However, by introducing 0.1 m redox additive to the electrolyte the specific capacitance of Co2P2O7 nanosheets increased more than twofolds (580 F g−1 at 1 A g−1 current density), which is due to the improvement of redox reactions at the electrode/electrolyte interface and the enhanced ionic conductivity of electrolyte. Furthermore, with the redox additive, Co2P2O7 nanosheets show an excellent cyclic stability (96% retention of its initial capacitance) and coulombic efficiency (99% retention) up to 5000 cycles at high current density 10 A g−1. 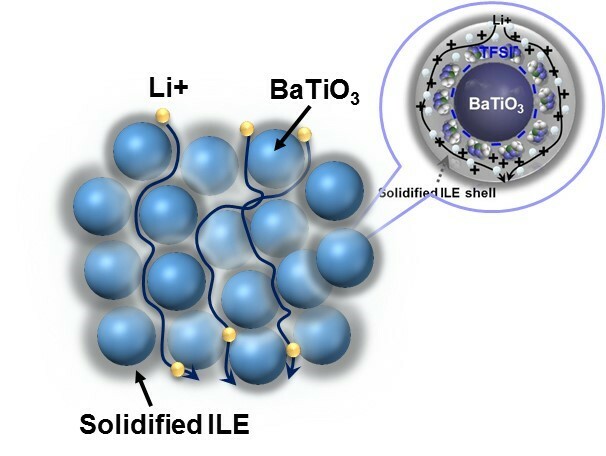 This study describes the preparation of a unique hybrid solid-state electrolyte composed of an ionic liquid electrolyte (LiTFSI/Pyr14TFSI) and BaTiO3 nano-sized ceramic particles without polymer. The semi-solid electrolyte exhibits high thermal stability, a wide electrochemical window, good ionic conductivity, and remarkably high electrochemical properties. In this study, a composite polymer matrix for gel polymer electrolyte (GPE) is prepared by the electrospinning process, combining poly(vinylidene fluoride-co-hexafluoropropylene) and nano-sized Al2O3 ceramic particles. The composite matrix is impregnated with a liquid electrolyte to prepare the GPE-Al2O3 composite and its properties are compared with those of pure GPE. The GPE-Al2O3 composite improves the interfacial resistance, ion coordination and the electrochemical stability of the GPE. The electrochemical performances are analyzed by applying the GPEs to LiNi1/3Mn1/3Co1/3O2 (NMC) and Li4Ti5O12(LTO) cells. The GPE-Al2O3 composite exhibits a higher discharge capacity than the GPE at 0.1 C-rate and excellent performance in both the LTO and the NMC half-cells under cyclic conditions. 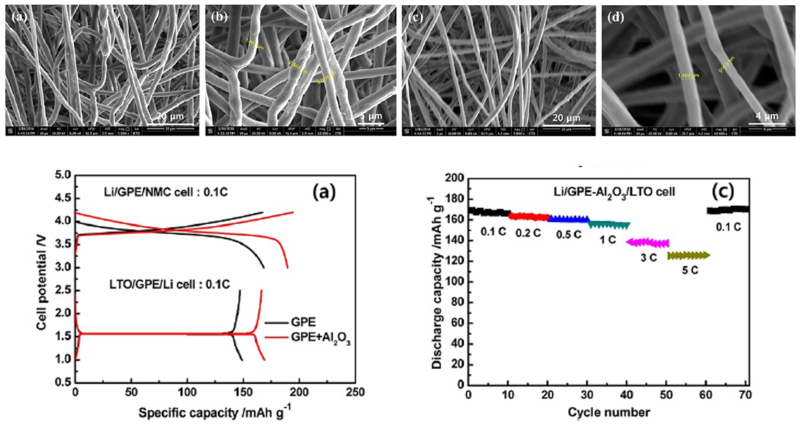 The GPE-Al2O3 composite shows good compatibility and high electrochemical property on LTO/NMC full-cell. Sodium-ion batteries are now close to replacing lithium-ion batteries because they provide superior alternative energy storage solutions that are in great demand, particularly for large-scale applications. To that end, the present study is focused on the properties of a new type of dual-electrode material, Na0.5Ni0.25Mn0.75O2, synthesized using a mixed hydroxy-carbonate route. Cyclic voltammetry confirms that redox couples, at high and low voltage ranges, are facilitated by the unique features and properties of this dual-electrode, through sodium ion deintercalation/intercalation into the layered Na0.5Ni0.25Mn0.75O2 material. This material provides superior performance for Na-ion batteries, as evidenced by the fabricated sodium cell that yielded initial charge-discharge capacities of 125/218 mAh g–1 in the voltage range of 1.5 – 4.4 V at 0.5 C. At a low voltage range (1.5 – 2.6V), the anode cell delivered discharge-charge capacities of 100/99 mAh g–1 with 99% capacity retention, which corresponds to highly reversible redox reaction of the Mn4+/3+ reduction and the Mn3+/4+ oxidation observed at 1.85 and 2.06 V, respectively. The symmetric Na-ion cell, fabricated using Na0.5Ni0.25Mn0.75O2, yielded initial charge-discharge capacities of 196/187 µAh at 107 µA. These results encourage the further development of new types of futuristic sodium-ion-battery based energy storage systems. Metal-air batteries show great promise because of their high theoretical energy density resulting from the use of an unlimited, low-mass O2 gaseous reactant. Nevertheless, several issues remain to be tackled for their practical implementaion in ambient air. In this work, we constructed a hybrid-type Na-air battery with a flow-through configuration for direct use of ambient oxygen as the cathode, and studied the effect of the flow of the aqueous catholyte on the electrochemical properties. In addition, the effect of the catholyte pH on the open-circuit and discharge-charge voltage behavior of the hybrid Na-air battery was systematically investigated. An enhanced operation voltage was found for the flow cell using an acidic catholyte composed of 1 M NaNO3 and 0.1 M citric acid (pH=~1.8). Further improvement in the cell performance was observed in a cell employing both Pt/C and IrO2 electrocatalysts, which showed an average voltage gap of ~0.4 V between the charge (~3.7 V) and discharge (~3.3 V) voltages vs. Na+/Na at a current rate of 0.1 mA cm-2 over 20 cycles (200 h total). These findings suggest that the hybrid Na-air battery system using a flow-through mode and an acidic catholyte could be a promising way to achieve practical Na-air cells with desirable performance. The successful analysis on the microstructure of Hong-type Na superionic conducting (NASICON) ceramics revealed that it consists of several heterogeneous phases: NASICON grains with rectangular shapes, monoclinic round ZrO2 particles, grain boundaries, a SiO2-rich vitrified phase, Na-rich amorphous particles, and pores. A dramatic microstructural evolution of NASICON ceramics was demonstrated via an in situ analysis, which showed that NASICON grains sequentially lost their original morphology and were transformed into comminuted particles (as indicated by the immersion of bulk NASICON samples into seawater at a temperature of 80 °C). The consecutive X-ray diffraction analysis represented that the significant shear stress inside NASICON ceramics caused their structural decomposition, during which H3O+ ions occupied ceramic Na+ sites (predominantly along the (1̅11) and (1̅33) planes), while the original Na+ cations came out in the (020) plane of the NASICON ceramic crystalline structure. The results of time-of-flight secondary-ion mass spectrometry analysis confirmed that large concentrations of Cl− and Na+ ions were distributed across the surface of NASICON ceramics, leading to local densification of a 20 μm thick surface layer after treatment within seawater solution at a temperature of 80 °C. Binder free and bi–functional electrocatalyst plays a vital role in the development of high performance metal–air batteries. Herein, we have synthesized a vanadium oxide (VO2) nanostructure as a novel binder free and bi–functional electrocatalyst for rechargeable aqueous sodium–air (Na–air) battery. VO2 nanostructures have been grown on reduced graphene oxide coated on carbon paper which have carambola morphology. We have confirmed bi–functional nature of VO2 nanostructure by analyzing its electrocatalytic activity associated with oxygen reduction reaction (ORR) and oxygen evolution reaction (OER). The reaction pathway associated with electrocatalytic activity was also affirmed by computational modeling & simulation studies. Thereafter, aqueous Na–air cell has been built using novel binder free VO2 nanostructures as air electrode. The fabricated cell displays 0.64 V overpotential gap, 104 mW g–1 power density at 80 mA g–1 current density, 81% round trip efficiency and good cyclic stability up to 50 cycles, which are comparable to the previous best known Na-air batteries. Sustainable, safe, and low-cost energy storage systems are essential for large-scale electrical energy storage. Herein, we report a sodium (Na)- ion hybrid electrolyte battery with a replaceable cathode system, which is separated from the Na metal anode by a Na superionic conducting ceramic. By using a fast Na-ion-intercalating nickel hexacyanoferrate (NiHCF) cathode along with an eco-friendly seawater catholyte, we demonstrate good cycling performance with an average discharge voltage of 3.4 V and capacity retention >80% over 100 cycles and >60% over 200 cycle. Remarkably, such high capacity retention is observed for both the initial as well as replaced cathodes. Moreover a Na-metal-free hybrid electrolyte battery containing hard ca bon as the anode exhibits an energy ~146 Wh kg-1 at a 10 mA g-1, which is comparable to that of batteries and much higher than that conventional aqueous Na-ion batteries. These results pave the way for further advances in sustainable energy storage technology.